This is our 1949 Motobecane Motoconfort D45A, This four stroke lateral valve 125 single offers some unique features you wouldn't otherwise see from bikes of this age. 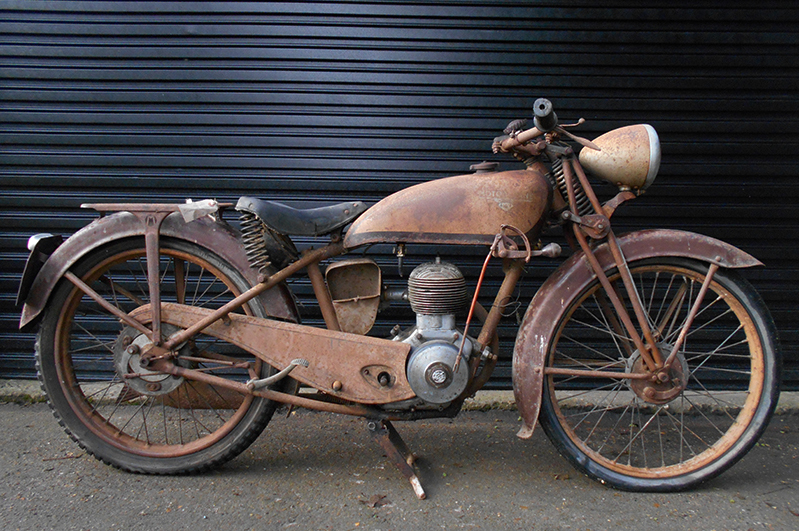 This specific Motobécane was baptised the D45(A) being the first of the three models available. The (A) model offering riders a parallelogram front suspension opposed to the voluminous front forks and sliding rear suspension found on the (B) model and the later (S) luxury model which had added chrome. All models are believed to have had the three-speed gearbox controlled by the right hand and a clutch lever that is found on the left-hand crankcase (Foot operated), although having a clutch lever where you would expect, this small lever was to promote young people and children to ride these small motorcycles. Very unusual! More subtle changes came later on in production, for example, a larger oil sump for added cooling and slightly bigger tyres for extra comfort not displayed on this model. In 1948, the D45(B) was advertised that it was "Faster than the train", a gentlemen by the name of Georges Monneret and his sons Pierre and Jean, rallied from Paris to Alpe d'Huez in just under 13 hours and 45 minutes! This was much faster than the train at the time (Trains of today cover the same distance in only 10 hours and 40 minutes), with an average fuel consumption of 2.5 litres per 100 Km this later (B) model became a very popular in its day.